This recipe is a perfect example of the way modern chefs can adapt classic French dishes to fit them into our busy contemporary lives. In the old days, one first had to remove the leaves and chokes of whole artichokes, retaining only the hearts — or bottoms, as they are known in France. Only after this painstaking chore could one begin making the soup. These days frozen food has come to the rescue. Eh oui, mes amis, The Everyday French Chef recommends using frozen artichoke hearts, as long as they are of good quality. One word of advice: The artichoke hearts sold in jars or cans, with leaves and a little of the choke attached, are not appropriate for this soup. Bring the water and salt to a boil in a medium-size soup pot. Add the artichoke hearts and cook until they are very tender, 15-20 minutes. Blend the artichokes with their cooking liquid into a smooth emulsion. If it is too thick — more like a purée than a soup — add a little water. Transfer the mixture to a clean pot. Stir in 2 tbsp. olive oil and the cream. Add 1 pinch of saffron. Grind in some pepper, taste and adjust the seasonings. Reheat gently. While the soup is reheating, pour 2 tsp. olive oil into a very small cup. Add the other pinch of saffron and stir to make a sauce. When ready to serve the soup, ladle it into individual bowls. 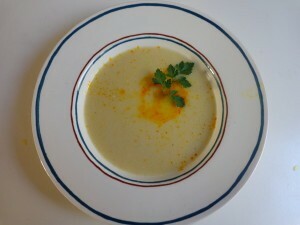 Drizzle a little of the the saffron sauce onto each bowl of soup and give it a swirl. Decorate with parsley. Serves 4. Meg, I made this today, and it was f-a-n-t-a-s-t-i-c. And so easy. Great! So glad it turned out well. Meg, I love the idea of your cookbook and will spread the word. I also love your artichoke soup recipe. As a historical morsel, I cite below my grandmother’s recipe which takes ages to make. Loyalties aside, I’m jumping in the 21st century with your recipe. For each person: Take a cooked artichoke and strip it of its leaves. If the soup looks too lumpy, you may puree it. Heat and add a spoonful of sherry. Serve hot with the heart floating on the top. Fill the heart with butter mixed with parsley or other finely chopped herbs. Mary, this recipe is a gem! I guess it tells us something about the changing roles of women in recent decades. Can you imagine taking the time to scrape each artichoke leaf with a silver spoon? Meantime, many thanks for your support on the cookbook front. I do hope this book will eventually see the light of day.